So I’ve just returned from an amazing professional conference in Boston. I had a wonderful time catching up with people I haven’t seen in years and also learning a great deal through various sessions with people who are outstanding in their particular fields. I went to several sessions about incorporating media into Jewish congregational life and how seamlessly and effortlessly this can often be done. The truth is that we may be a tradition that extends back over 5,000 years but this stuff is clearly the future and we want to perpetuate ourselves for coming generations than Rabbis and other Jewish professionals really need to get on board with this stuff. I had a fabulous time learning things about blogging and media usage that I never knew. In one session I asked the facilitator a questions that really related to the Hagsaeng Naebu blog more so than the blog I supervise at my congregation. I mentioned how hard it sometimes is to think of content – good content (especially when under the pressure of a deadline!). She laughed and acknolwedged how true this is and then offered several suggestions. Why not farm it out, she suggested, it’s a great way to empower other intelligent, thinking lay people at your congregation (so true…this is indeed how I keep content fresh and new on my congregations blog and in fact, it’s precisely how Master Pearson has managed this blog). 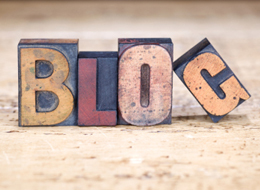 Then she wondered out loud why more of us don’t link content from one another’s blogs or twitter feeds to our own… As Master Pearson would say, “ding…little lightbulb!” Yes, I thought, this seemed so obvious! Now maybe I wouldn’t want to link content from a blog at another congregation right down the road, but there is no reason not to look for amazing, intelligent, thought provoking articles from my colleagues in other states and countries. This was a genius suggestions, I thought, and it could certainly carry over into our own Hagsaeng Naebu blog…for there are of course, other interesting martial artist out there who publish content about their own journeys and thoughts. And so I stumbled today upon a interesting blog, managed by a person (gender undetermined) who is spending some amount of time traveling through Japan (he or she was not very clear about the background to their blog). At some point throughout their travels, budo became a major focus for this individual and he or she attended several seminars sponsored by the Japanese Ministry of Education meant to re-introduce Japanese citizens to the arts so important to their past. The author spent time learning aikido, kendo and, my favorite, kyudo. He or she mentioned that by far the most popular art at these seminars was in fact kyudo. Perhaps because it seems so exotic, maybe because it is so intense…I don’t know. But I was happy to read that my love for this art was shared by others. After the author had pursued kyudo for some indeterminate amount of time (sorry, again I was poking around and didn’t read every entry! ), he or she entered into a competition. For me, competitive kyudo is an oxymoron. I was not raised in this art in a school like that. For us, your only competition was yourself and your own ego. It really became, for me, a very personal art – the chance, for at least the time during which I was shooting to really focus on self improvement. There was nothing between me and the azuchi, no real goal, no real target (ok, of course there was an actual target there – but I use target in a more metaphorical sense). I think this is precisely why this art was so important to me. The rest of life has certain trajectories, certain paths that you are expected to take, certain goals that you are expected to achieve. 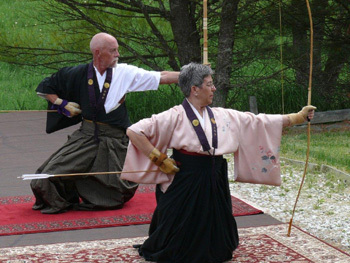 In kyudo, the self was the only goal, cutting the ego was the only real objective. It was so liberating, and it was so rare to have that amount of time, the level of intimacy in which to confront oneself, focus on oneself, and aim only to improve oneself. I really miss Kyudo and perhaps could use it now more than ever in my life. Isn’t Kyudo beautiful? This is actually a picture of two of our friends shooting: Jack and LJ Stewart. On a different and more exciting note, the author referred to this Kyudo competion (maybe it was more like a promotion exam, I’m not really sure) as TaiKai. Those of you who are ex-staff or campers of the Institute of Martial Excellence summer day camp will know why I was so excited to read this! The summers of 2006 and 2007 were defined at our Taekwondo school, by an event of the same name. This was a three day competition that I initially instituted and it was picked up by some of my staff in the following year. For us, TaiKai was a three day color war, during which campers were divided into teams and were pushed to outperform, out”behave” out-cheer, out-sing, out-act, out-create one another. It really filled our school with a beautiful and healthy competitive spirit and besides it was a ton of fun for staff and campers alike. When we (I think it was Walsh, Phatak, and myself) were first developing the idea, we tossed around name after name and each one was dumber than the other. And then, checking out a Japanese online dictionary (this was in days before Google translate…which would have made our lives so much easier! ), we stumbled upon the phrase TaiKai, meaning competition. It was perfect and the name has stuck ever since. Next PostHow fast is your reaction time? Hi there. Thanks for your comments. I think the thing about competition/taikai (usually for us it’s a one-day thing, but there are some that span several days) is that you can use it in many different ways. Fundamentally it’s just a bunch of people getting together to shoot, after all. Some people will indeed go all-out to win, but I think it’s more useful as a crucible for testing and observing one’s own mind. The pressure of competition: the results visible for all to see, wanting to do well in front of others, wanting to do well because your teammates are counting on you, or for the honor of your teacher, dojo, prefecture, nation, etc, all these are challenges that are more or less muted during regular practice. You can shrug off mistakes because they don’t seem count as much. But competition is more intense, and rather than just making it into a contest that someone wins and someone loses, you can apply that intensity to the spritual side. Resolve to shoot as best you can, by your own criteria, your own priorities, no matter what pressures or expectations are present. If you can do that in the dojo, you can do it elsewhere, so it can help take your shooting and your daily life to a different level. Anyway over time I’ve come to enjoy the challenge, even if it means getting up much too early on a weekend!